The Gray Fossil Site is located in Washington County near the community of Gray, Tennessee. Larry Bolt, a geologist with the Tennessee Department of Transportation, first noticed the unusual clays in excavations into Fulkerson Road, a side street, during the realignment and widening of State Route 75. No one in his office or on construction crews had seen anything like it in the region. He brought samples of the black and gray layered clays to the Tennessee Division of Geology's Knoxville office, which led to a cooperative excursion on May 31, 2000, before bulldozers removed more of the material. That visit led to the initial discovery of bones and fragments by the author, who was searching more for fossil aquatic life. Other participants (Larry Bolt, Peter Lemiszki and Robert Price) watching a nearby exploratory backhoe operation, recovered additional bone specimens within minutes. The rest of the day, after another stop, and the long drive home were spent discussing the site's origin and the stories it might have to tell. The bedrock setting suggested a karst feature such as a sinkhole pond, while laminated clays, with what appeared to be glacial dropstones, hinted at glaciation. Gravels and foreset bedding required a fluvial connection, and the fractures and faults suggested slumping, compaction, or maybe even a record of earthquake movements. The author wishes to thank Peter Lemiszki, Robert Price, and Larry Bolt for their assistance and cooperation, the Division of Geology for license to work on this project, and Paul Parmalee at the University of Tennessee McClung Museum for his help in identifying some of the bones soon after their discovery. The site is located in the Valley-and-Ridge province in upper East Tennessee. It forms a low knoll, the top of which stood nearly 30 meters above the adjacent drainage, prior to excavation. Subsequent drilling by the Department of Transportation has delineated an area at least 220 meters long, about a hundred meters wide, and underlain by up to 36 meters of gray and black clays. Where well defined, the boundaries of the deposit are abrupt and suggest a steep-sided erosional feature in the bedrock. The fossils occur in a deposit primarily of layered black, gray, white, and buff colored clay and silt. Most layers show normally graded bedding on the scale of 1-10 mm. The dark clays are intermixed with lenses and layers of chert gravel, sand-sized material, and dolomite fragments. Within the dark clays there are a number of large (up to car-sized) boulders or blocks of dolomite. The dark clays also seem to contain the majority of the bones. When fresh, the clays have the property of turning from grayish brown, (5YR 3/2) to brownish black (5YR 2/1) within two minutes of exposure to air, eventually approaching very dark gray (N 2.5). This stands out in sharp contrast to typical residual reddish clay soil that develops over carbonate bedrock in this region. The layering is deformed, dipping inwards up to 45° towards a central axis, likely due to the removal of material from below, or to compaction. Small mesoscopic normal fault planes and extension fractures, iron-stained near the surface, are common, and some folding is present. There are several thin cemented layers that show discrete brittle fracturing due to extension. The fractures are filled in with the more ductile clay. Bedrock near the site is northwest-dipping Lower Ordovician age dolomite of the upper part of the Knox Group. A syncline axis exposes Middle Ordovician Lenoir Limestone a few hundred meters to the northwest. Older limestone of the Lower Ordovician Chepultepec Formation is exposed to the southeast. These units form karstic terraines throughout the region, and younger Pleistocene age bones have been found in a number of caves as well. Ancient sinkholes have also preserved clays and lignites in this region, but to date, this is the only such deposit known with animal bones. Aquatic invertebrates include ostracods, snails (probable planorbidae, possible viviparidae), and small fingernail clams (sphaeriidae), occurring in many layers. Land snail shells similar to Anguispira (discidae) have been found. Some fish remains have also been found. The lower light gray layered clays show black leaf imprints, while the dark layers contain abundant macerated organic debris, as well as flattened, carbonized, but still flexible sticks, carbonized acorns, nuts, and other seeds, and compressed pieces of various kinds of wood, much of it brown in color. Charcoal is also present, the rigidity of which preserved much of the original structural geometry and porosity. Vertebrate bones recovered during and immediately after earthmoving operations have been primarily tapir, also turtles. Some crocodilian remains have been encountered, as have tusk fragments, a partial jaw, humerus, and carpal bones of a rhinoceros. Frogs, snakes, numerous insects, and a distal phalanx of a bear are also represented. 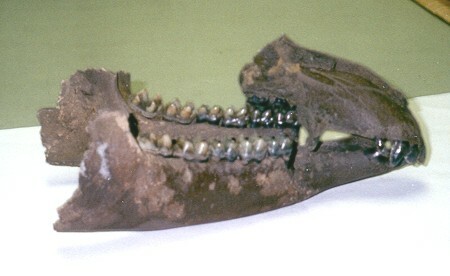 A Miocene age has been suggested for this deposit based on an identification of the rhinoceros bones. Tapirs include juveniles, adults, and old individuals represented by teeth showing considerable wear. Many bones are fragmented and broken, while others remained articulated, but no evidence of predation, scavenging, or butchering has been seen in the bones so far examined. The geological origin of this deposit remains problematic, although some process related to karst and cave formation appears most likely. A spring, perhaps mineralized, is also a possibility, as is a deeply cut oxbow meander beneath a tall bluff. A single large block of very coarse grained calcite was encountered in the dark clay. Its yellowish color and parallel crystal growth habit were typical of cave deposits, but the crystals were about five times typical size. No bat remains or guano have been identified. Very few quartzite cobbles, typical of major rivers in this area, have been encountered. Fossil bones and other materials were on display at the Gray Branch Library, on State Route 75, just off I-181, at the Hands On! Museum, 315 E. Main Street, in downtown Johnson City, and at the Bays Mountain Planetarium at Kingsport. Some may be viewed at the TDOT office, 7345 Region Lane at the Strawberry Plains Pike exit, I-40 east of Knoxville, Tennessee. Others are on display at the University of Tennessee McClung Museum's Geology and the Fossil History of Tennessee exhibit. Most of the bones imaged here are presently curated at the McClung Museum, University of Tennessee. Now, the museum at the Gray Fossil Site (http://www.grayfossilmuseum.com/ ) offers extensive displays related to the site, as well as tours of the laboratories and active digs. May 2, 2006 - Sept. 24, 2007; no data.